Norma is another of Lacaille's southern constellations. Originally called Norma et Regula, the names referred to the carpenter's tools: the square and the level. 62k Labeled JPEG NGC6167 (Bennett 79a) is a mag. 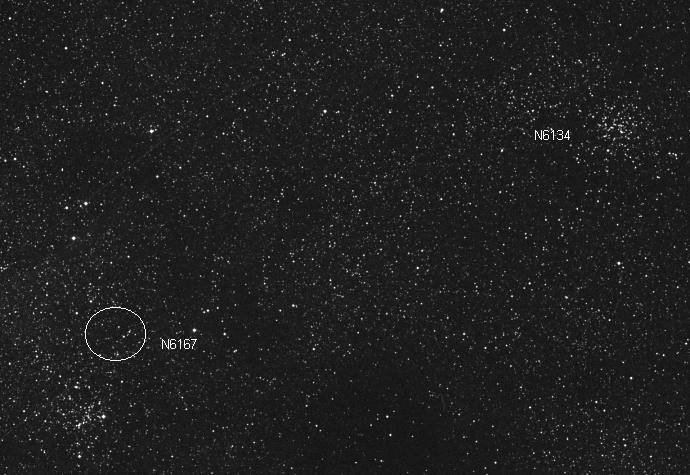 6.7 open cluster located 2.4° NNE of Gamma Normae on the Ara border. Dreyer calls it large (8'), and little condensed, and irregular in shape. Its 218 stars range from mag. 7.5 and fainter, much fainter. Most begin at mag. 11. Note the plotted position of the cluster in a relatively empty section of the labeled photograph, while a denser area lies 11' to the south. NGC6134 (Bennett 76) is a mag. 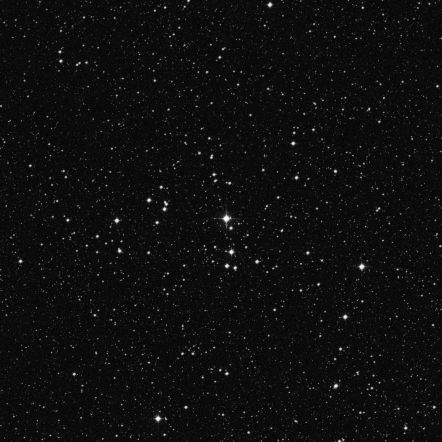 7.2 open cluster that lies 1.2° to the WNW. Dreyer says it is quite large (7'), fairly rich, but with little condensation. It contains stars (179 of them) of mag. 13-15. Other sources list the brightest stars at mag. 9.3. Image is a Mosaic created from two Digital Sky Survey downloads. 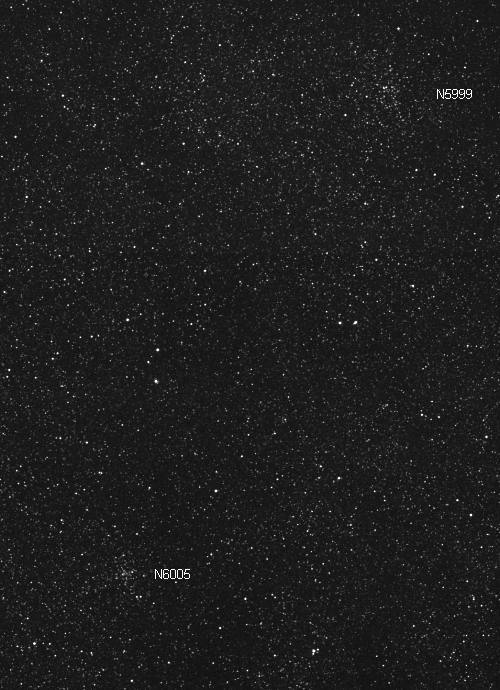 108k Labeled JPEG Three open clusters occupy a 2° area of sky. We will move from east to west in describing them. NGC6067 (Caldwell 89) is an open cluster located 4.2° SSW of Gamma Normae and 25' north of Kappa Normae. Dreyer calls it a very bright (mag. 5.6), very large (13'), and very rich. It shows little condensation, and yields 100 stars from mag. 10 and fainter. NGC6031's description reads: Small (2'), much condensed, with stars ranging from magnitudes 11-14. Its 20 stars combine to shine at mag. 8.5. It lies 50' west of NGC6067. Trumpler 23 (Collinder 295, Bennett 72a) lies another 1.1° to the WNW. Its combined magnitude is 11.2; its 40 stars quite faint. While visible with a 6" as the typical, 5' "fuzzy patch," resolution will require dark skies and large aperture. Image is a triple download mosaic from the Digital Sky Survey. 80k JPEG NGC6087 is another open cluster 3.8° SSE of NGC6067. Described as bright (mag. 5.4), large (12'), with little condensation, it contains about 40 stars from mags. 7-10. 65k Labeled JPEG NGC5999 (Bennett 71) is an open cluster located in south-central Norma, 2° north-west of Iota-1 Normae. Dreyer says it is large (5') and fairly rich (40 stars), with stars ranging from mags. 12-14. Overall brightness is about mag. 9. Lying 1.1° SSE is NGC6005 (Bennett 72), described as fairly small (3'), fairly rich (35 stars) and much compressed. Dreyer states that the individual stars shine at mag. 16. Others say they shine a mag. 11.8 and fainter. Overall magnitude is 10.7. 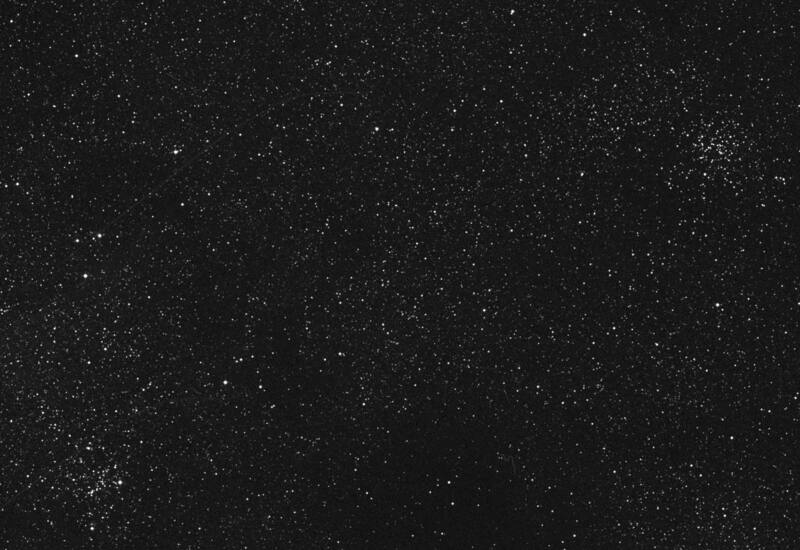 Image is a mosaic of two Digital Sky Survey downloads. 74k JPEG NGC5927 is a globular cluster located in Lupus 2.8° NE of Zeta Lupi. Dreyer describes it as quite bright (mag 8.3), large (12'), round, and very rich, with stars mag. 15 and fainter. NGC5946 sits just across the border in Norma, 1.2° to the east. Another globular cluster, it is quite bright (mag. 9.6), fairly large (7.1'), round, with little brightening toward the middle. 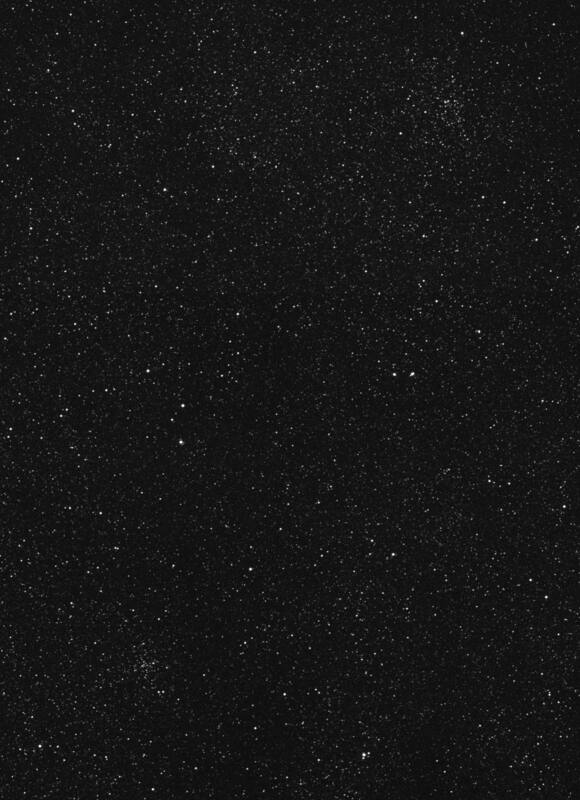 Image is a mosaic of two downloads from the Digital Sky Survey.